Ugadi is just around the corner. So, it’s mango time at my home and I made thurumu pacchadi in advance for festival day meal on Ugadi. The preparation took about 20 minutes. Very easy, a delight to the senses, I like this pacchadi very much. Take one extremely firm, unripe mango of medium size. Wash. Lightly peel and remove the skin. 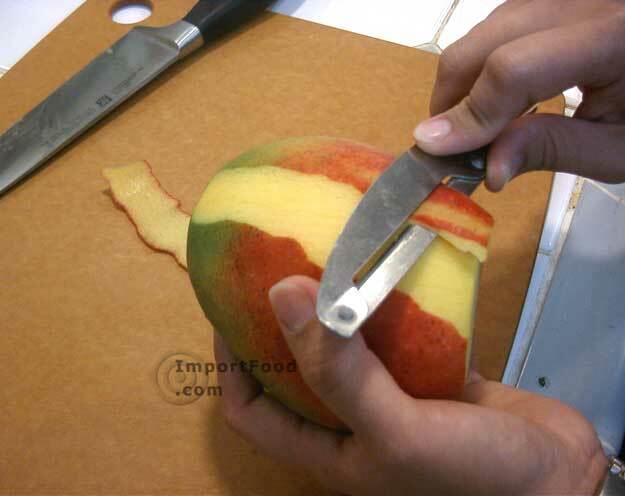 Using a grater, grate the mango until you reach the seed on all sides, like shown in the photo above. Mango gratings came about two cups for me. one teaspoon each - methi seeds and mustard seeds to two minutes. 4 Indian variety, dried red chillies to pale brown. Take them all in a mixer or spice grinder. Add half-teaspoon salt. Grind to fine powder. 1. Take mango gratings in a vessel. Add the methi-mustard seasoning. Combine well. 2. Add the toasted tadka ingredients to the mango gratings. Mix thoroughly. 3. Store the pacchadi in a clean jar. Stays fresh for two to three days upto a week, and traditionally we do not refrigerate. Just don’t use wet spoons. Mango turumu pacchadi tastes wonderful when mixed and eaten with rice and dal or sambar.